The axle is the main means of transferring power created by the engine to the tires. A axle can generally take quite a beating, but it isn't invincible and can crack or snap due something as simple as a bad bump in the road. Other issues can cause axle trouble as well, such as driving with a faulty carrier bearing, overloading a vehicle with too heavy of cargo or a collision with another vehicle or object. If your vehicle begins to express the following symptoms of axle issues, especially after any sort of collision or other snag in your path, you may want to visit a local auto repair shop that understands axle repair. One of the most obvious signs your vehicle has potential axle damage is if it won't move. More than likely the car will start and run as normal and the transmission will even go into gear, but then would not be able to move under its own power. This type of axle issue would most likely follow some sort of collision as this problem would only occur if the axle has snapped near the universal joint. While vibrations that occur in a vehicle can be created by quite a number of different issues, axle damage provides a shaking sensation unlike anything else. However, to be sure the problem is related to axle damage there is a small test that you can do. Drive the troubled car at a slow pace down a street that isn't busy to see if you can detect the location of the odd vibrations or other rumbling sensation. Axle issues will be especially apparent during acceleration or while cornering. Even at slow speeds you will feel the vibration radiating from the undercarriage, likely near a tire, if it is related to axle damage. A bent axle will cause driving to feel sluggish and steering may not be as responsive as normal. A loud and sudden clanking or cluttering noise that happens as you press the accelerator pedal and begin to move from a stop may be caused by the car struggling to get power to the wheels. This problem can also be caused by a few different issues so you will want to head to the local mechanic shop to find out if your axle is damaged or if the problem is related to an issue that requires transmission repair. If you've had a recent run in with a curb or been subject to a collision and are now having issues getting power to the tires, there is a good chance that there is some form of axle damage. For expert axle repair in Covina, CA, head to Hye Tech Auto. 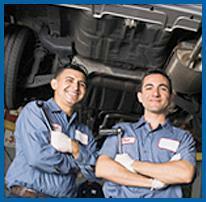 Our team offers full service auto repair to keep your vehicle running smooth. Give us a call at (626) 332-5452 to request an appointment for professional auto repair in Covina or the neighboring communities.